Relationships are a living agreement, one that asks both partners to continually choose to renew. But, like that apartment or house you live in—you loved it when you walked through the doors, dreamt about its possibilities, dreamed together about how to decorate it, what color to paint the walls, etc. 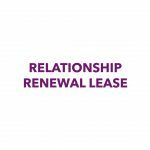 Whether you signed a one year or two year lease, inevitably, you have to ask yourself do I want renew and continue? Or does our home need some TLC, new paint, fix some minor cracks, reupholster the couch. Your relationship asks the same thing, to think about what’s working, what’s not working- what you wish for, what you need from it, what you can promise to give towards it. How you can love and take care of it better. When’s the last time you sat down with your partner and explored this together, how are we doing? Would you sign a renewal lease as is, or are there parts of us that we need to look at, and see if we can shift around? I highly recommend doing this at least once a year, heck maybe twice a year- a meeting of the minds, to discuss your past, present, and future together.